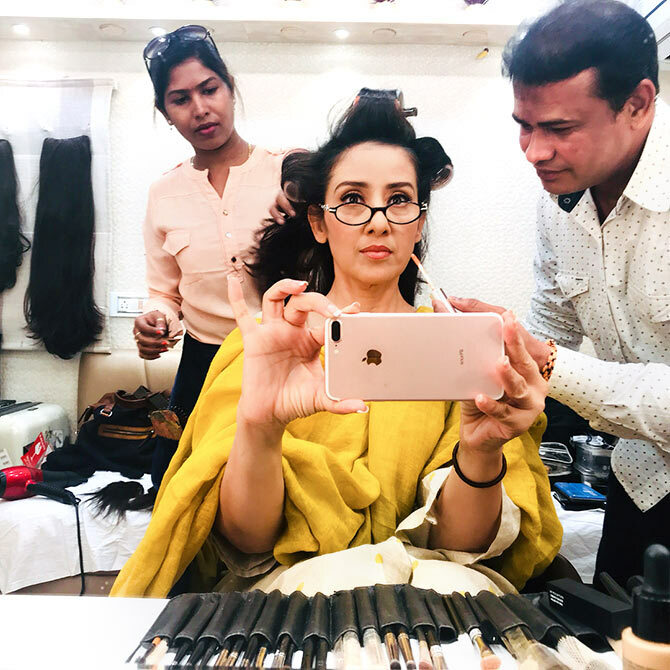 Manisha Koirala tells Ronjita Kulkarni/Rediff.com what she now wants from life. 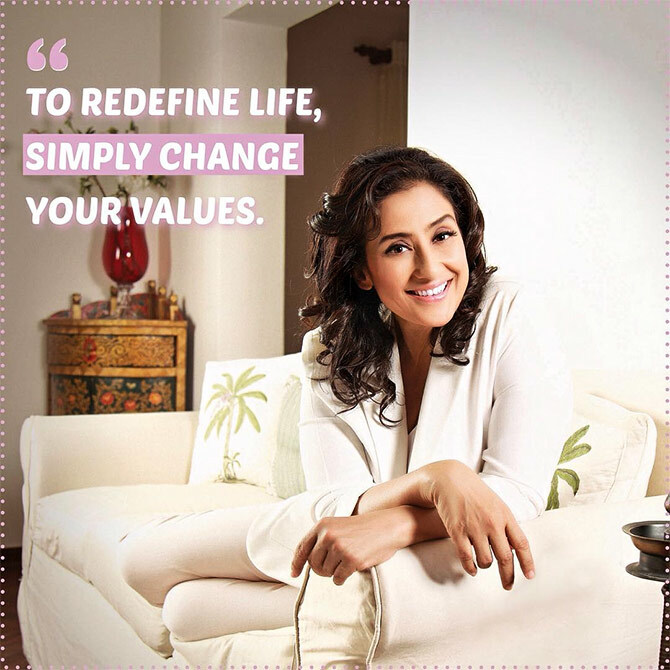 It has been a long day of interviews, but the smile stays on Manisha Koirala's radiant face. She is in a happy space, working in films she would like to be a part of, balancing her career with all the fun thing she likes doing. In Netflix's ombibus Lust Stories, she stars in the segment directed by Dibakar Banerjee. "It was a leap of faith to be a part of this kind of film," Manisha says, sipping coffee. "I recently saw the entire film, and it's good. When you have good directors, even with a subject like this can make it a good film. That's where it got saved. Otherwise, it's very easy to become sleazy. I would never touch it if it was any other director. Never!" Manisha enjoyed the quirkiness that she saw in Dibakar. "The confidence and willingness to explore and make a film without a bound script... to say that aisa karke dekhte hai, yeh try karte hai... You need to have confidence and boldness to make a film and leave it open (ended)," she says. "Dibakar makes movies for intellectuals, film buffs. He has studied movies and knows it inside out. I like his mind. It's good to be working with new age directors and new age set-ups," Manisha says with a smile. Jaideep Ahlawat and Manisha Koirala in Lust Stories. Manisha is very thrilled about Rajkumar Hirani's Sanju, a biopic on her co-star in quite a few movies. 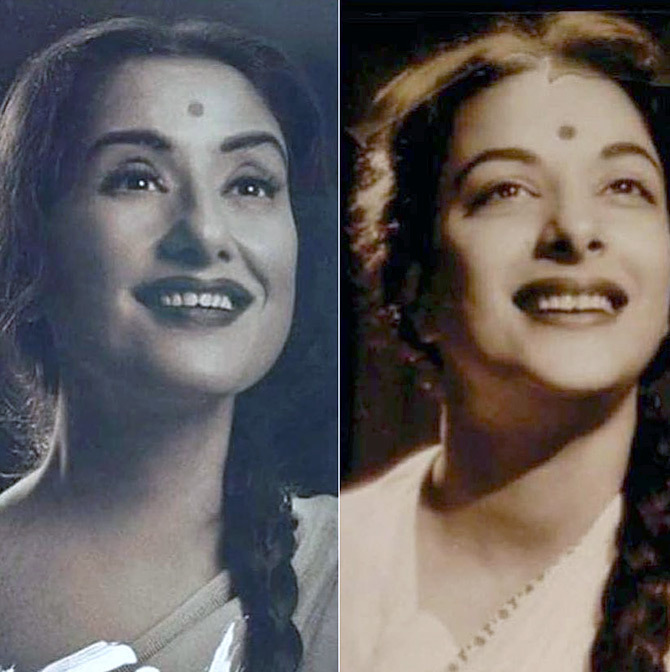 She plays Nargis Dutt, the late legendary actress and Sanjay Dutt's beloved mother. Nargis died of cancer, a disease Manisha overcame barely six years ago. "I was in Nepal, spending time with my parents, when I got a call from Hirani sir," Manisha says. "Initially, I wondered whether I would be able to portray a cancer patient. I came to Mumbai and met him. Then, I totally fell in love with the whole environment and the way he was making the film." Filming the cancer bits was "tough," Manisha says, but adds that the film does not dwell on that aspect too much. "I was very nervous, but we didn't spend too much time on that," Manisha says, adding, "This movie doesn't have melodrama, but it will touch your heart." Sanjay Dutt and Manisha in Baaghi. Nargis passed away on May 3, 1981, five days before her son's debut film Rocky released. Did she ever discuss Nargis with Sanjay Dutt when they made movies together in the 1990s? "Baba (as Sanjay Dutt is fondly called) and I did not get into a personal space, where we discussed personal things. We never did that," she recalls. "On the sets, Baba was always full of pranks, having fun and joking." Manisha reunites with Sanjay Dutt on screen in his production, Prasthanam, where she plays his wife. Sanjay Dutt still does not discuss his mother, but he did complement Manisha on how closely she resembles the iconic actress. "Both Baba and I, in different ways, have gone through a lot in our lives, and we are back again. So I understand what he has been through," Manisha says. While Sanjay Dutt did not offer any insight into his mother, his sister Priya Dutt, the former Congress MP, did. Hirani also showed Manisha documentaries and photographs to bring in Nargis's mannerisms. "And her spirit, more than anything else," Manisha says emphatically. There were a lot of look tests as well to get it right. "Those days, eyebrows were made differently, lips were made differently, hair was made differently... I had to change the hairstylist and get someone who had worked with the older generation of actresses. Also, she wore a lot of whites, so I added that," explains Manisha. Her eyes light up when she talks about Ranbir Kapoor, who plays the title role, and says he has totally "nailed it". "He is a phenomenon, a brilliant actor. He is easily the best actor we have in today's times," she raves. While they play mother and son in the film, Manisha says they never bonded during the filming. "We were busy with our characters; it is such a demanding space. So no, we did not bond so much. I have been admiring his work ever since I saw the rushes," she says. In a television interview to Rajeev Masand last year, Manisha had said she was worried about getting typecast in mothers' roles. What changed her mind was a narration Hirani gave her of a scene, and she was game. Working with Hirani, was very thrilling for Manisha. "He is brilliant! I've watched his films, so to work with him is a great opportunity for me. His movies are so entertaining, so massy and yet, so pleasant. I love that. There is always a learning as well," she says. She sees his strengths in his writing and editing. "And his heart," she says. "He comes out with these beautiful messages. Every director, when they make a film, their souls speak. The kind of stories they choose to make, it shows their souls." Manisha doesn't know where her career is heading. "I would like to be having opportunities like this come my way. I want to do justice to the opportunities I get," she says. "And I should be able to enjoy it, that's where my focus lies. I should enjoy my work," she adds. "I should get opportunities to expand my boundaries and at the end of the day, get a pat on my back." The actress who has worked in some of Hindi cinema's finest films does not like watching them. "I don't watch my old films. It's over and done with. I'm proud of my films, but who watches their movies after 20 years?" she says, with a laugh. Watching movies, in fact, is not a big part of her life anymore. Instead, Manisha prefers gardening. She tends to her terrace organic garden in Mumbai. "I have also started swimming recently. 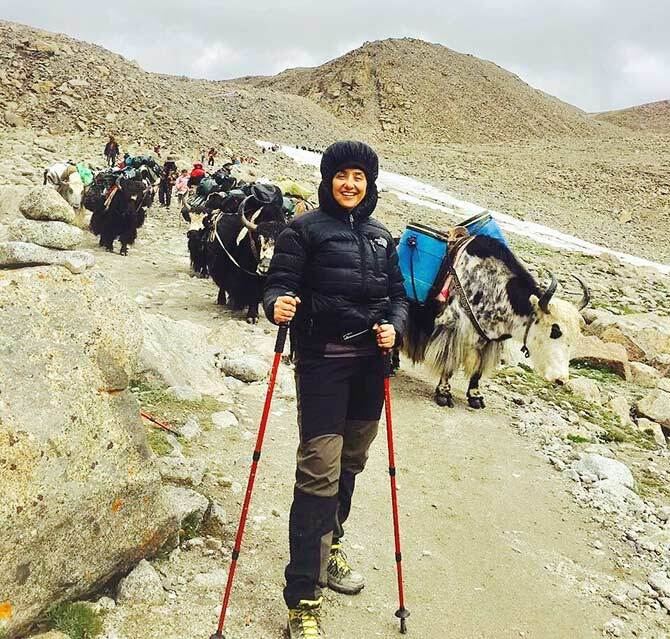 When I'm in Kathmandu, I go out into the hills and go trekking," she says. She is also working on her memoirs which is "80 per cent complete". Irrfan Khan, who is battling neuroendocrine cancer, posted a touching note this week about his illness. "I know exactly what he is going through," Manisha says, softly. "After reading his post, I immediately messaged his wife Sutapa to know if the family was faring well." "How beautifully Irrfan writes about each flower, twig and bud... It's like a third eye has opened, and it appreciates the small aspects of life that we otherwise overlook. The sunrise, the sunset, the flowers, the grass, birds, animals, people..." Manisha says. "You realise your health is your number one wealth because without it, you cannot enjoy anything in life." "Cancer taught me to appreciate life," she adds. "It taught me that I should not take life for granted, to be grateful that I am healthy, that I have an amazing family." "As human beings, we are not isolated. We need people around us, our own people, who will be with us through ups and downs, and to value those people and relationships." "It is one chance to life, live it fully." "Live and be joyful for what you have because one fine day, it will be all gone."